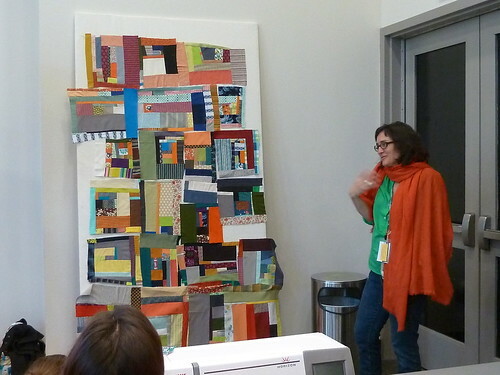 Kathy and I had the honor of taking the Denyse Schmidt Impovisational Patchwork workshop at Quiltcon in Austin Texas. What a day we had! Talk about inspiration. As a new quilter, the workshop opened up a whole new world to me. The design process Denyse used made it easy to get straight to sewing. Three shopping bags marked small, medium and large were placed on the table. Denyse instructed us to reach into the small bag, without looking (that was the hard part), grab 2 pieces of fabric and sew them together. Keep grabbing and sewing pieces together from the small bag, one fabric at a time, until your block outgrows the scrap sizes in the bag. Then move on to the medium bag. The grab and sew process removes the decision of fabric placement which frees up the design process. Decision making becomes minimal. We could trim fabric off the ends, but we weren’t supposed to square up the block. 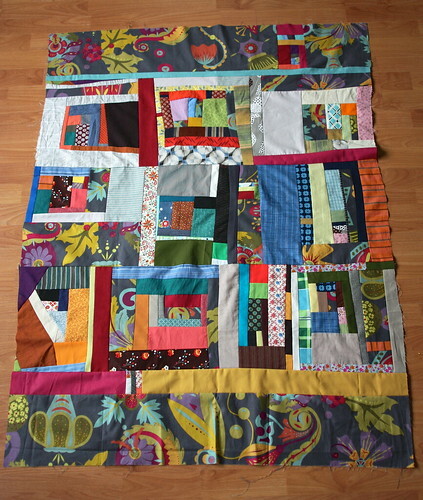 The bits we cut off could be incorporated back into the quilt as needed. The imposed time limit, for each block, encouraged us to work quickly without over thinking each step. Our supply list for the workshop instructed us to bring one of our favorite fabrics. I chose Alison Glass Lucky Penny Mural in Grey, from my stash. Our favorite fabric was then cut it into strips of small, medium and large widths. We then grabbed from the bags, and added in our favorite fabric as we sewed. Denyse instructed us to add as much or as little of our fabric as we were inspired. We had about 2 hours to make 4-6 blocks. 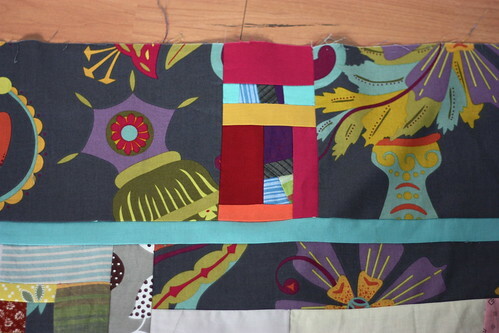 Upon leaving the class I had 6 completed blocks using my Lucky Penny fabric and 4 practice blocks. 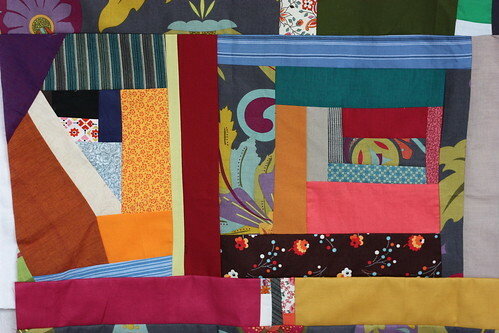 Denyse suggested I use the left over strips of my favorite fabric at each end of the quilt top. In the future, Denyse also suggested using more of my main print in each block. I must admit, I was afraid to use too much of the main print. Back at home, my friend and Pink Chalk Team member Melissa, encouraged me to use all the blocks made in the workshop to complete the top. We played with placement adding bits of the main print here and there. 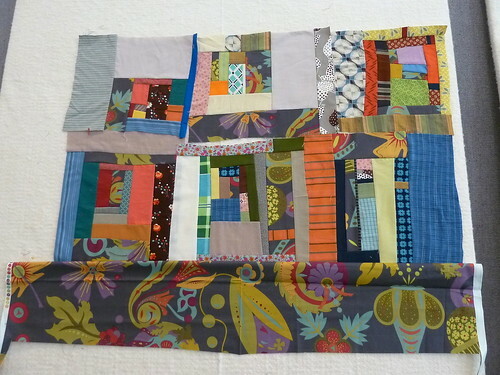 Reflections – I enjoyed the improv style of piecing in so many ways. The color person in me was not happy at first. Color is my thing!… I have to admit a little secret… Inside the bag next to my chair, during the class, I had every single solid coordinate for Lucky Penny. How could I NOT bring those to class with me? I was a little worried Kathy would rat me out to Denyse, but she didn’t. So… Embrace the power of the bag! That became my mantra. When the bag gave me soft pink, I took a breath and stitched it onto my block. I learned to let go of perfect color selection. Grab fabric, sew it together and see what happens. Let the power of chance play out in your design. You just might stumble upon the most fabulous combination of color, texture and composition. It looks great Diana! 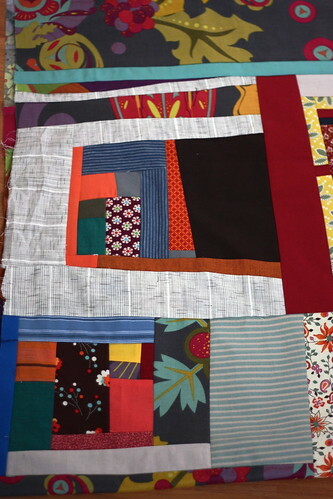 I can’t wait to see the finished quilt! Sound like fun…like spontaneous collage creation. I’m curious tho…what was the top and bottom boarder fabric? I think i’m in love with yet another seemingly abstract print. How wonderful and so inspiring! It looks great. Thanks so much for sharing your experience in Denyse’s class. I can relate to the difficulty in relinquishing control over fabric selection; the idea of having a main fabric that kind of ties it all together would make me feel more comfortable with the process. I’m getting ready to organize my scraps and I may make some small, medium, and large bags as I do that. Thanks for sharing about this workshop. Sounds like such a fun time! I definitely like the blocks you created! The result is very playful! Sweet. Love this way of working – very free. think it will work well with children too.What sizes were the 3 different strips (approx)? This is so fun! I love what you made. Makes me want to go give it a try!